SB 375 requires the State’s 18 metropolitan areas, including the Bay Area, to develop strategies to reduce transportation-related greenhouse gas emissions. 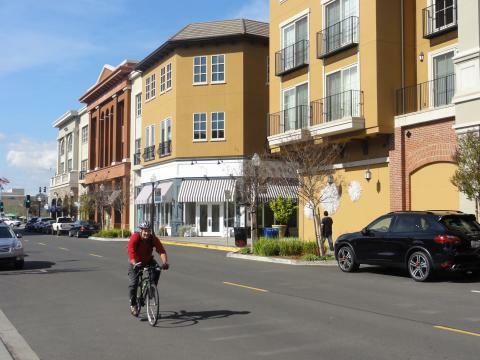 The law requires that the current Regional Transportation Plan (RTP), Plan Bay Area, include a Sustainable Communities Strategy (SCS) which promotes compact, mixed-use commercial and residential development. To meet the goals of SB 375 more of the future development is planned to be walkable and bikable and close to public transit, jobs, schools, shopping, parks, recreation and other amenities. To help achieve the goals of the SCS, the nine Bay Area counties have gone through a self identification process where they have voluntarily designated Priority Development Areas (PDAs) in their jurisdiction that can accommodate a majority of their future growth. The purpose of a PDA Investment and Growth Strategy is to ensure that CMAs understand the opportunities and barriers to develop PDAs in the region - in particular-what transportation investments should be made to best achieve the PDA’s housing goals. This PDA development strategy will be a working document to assist in priority-setting for transportation funding such as the One Bay Area Grant (OBAG), which supports and encourages development in the region’s PDAs. Recognizing the diversity of Napa County’s PDAs will require different strategies. The first step in the PDA process is to prepare an inventory of the PDAs and the current conditions within the PDA, document any planning that has already occurred, and identify the planning and capital needs of the PDA. There are two different PDAs within Napa County that have different PDA statuses. The PDA located in the City of American Canyon is a potential PDA, and the PDA in the City of Napa is a planned PDA. The main difference between these two PDA designations is that a potential PDA needs assistance with site specific planning. This could include a specific plan, area plan, master plan, redevelopment plan, or more detailed section of the general plan that has been adopted by the city council, and related California Environmental Quality Act (CEQA) review. Planned PDAs already have a more detailed PDA plan and have the necessary zoning and general plan updates so that all planning documents and development regulations are consistent, and the necessary CEQA review has been completed. Due to time constraints and available data, the Napa PDA Investment and Growth Strategy document focuses primarily on the existing conditions of the PDAs within Napa County and what future transportation infrastructure and strategies are needed to help PDAs meet its goals. The plan is intended to guide Congestion Management Agencies, such as NVTA, to monitor more closely land use policies and development within its jurisdictions to help achieve the goals of Plan Bay Area such as reduction of Green House Gases (GHGs) and encouraging transit oriented development. Topics addressed in this PDA assessment may include: current development status, pipeline projects, investment strategies, community support, transportation assets, bike and pedestrian infrastructure, incentives to attract market development, etc. The next PDA Investment and Growth Strategy Update is due to MTC by May 31, 2017 as part of the OBAG 2 process. NVTA has completed a Draft Update to the PDA Investment and Grwoth Strategy which is open for comment and will go to the NVTA Board for accept and file at the May 17th meeting.